Earlier this year, Vivera made headlines after debuting their vegan steaks at over 400 Tesco locations in the U.K. In fact, within just one week, the steak nearly sold out at 40,000 units! Now, this all-vegetarian company is releasing the “Veggie Quarter Pounder,” an Angus-style burger designed to compete with “high-end” beef. Vivera’s aim was to mimic the famous Aberdeen Angus beef burger. They’ve strived to produce a burger so tasty, so close in texture and appearance that any carnivore would be satisfied. Frying achieves a perfect sizzling exterior whilst staying tender in the middle. Nutritionally, the burger is high in protein and is a source of fiber, iron and vitamin B12. But it’s not just steaks and burgers. Vivera, which has been developing vegan and vegetarian meat replacements since 1990, sells more than 40 different high-quality vegan products already available in 23 European countries and about 25,000 supermarkets. As more people discover the extreme cruelty faced by farmed animals and the impending threat of climate change, they’re ditching meat and other animal products in favor of plant-based alternatives. As a result, sales of plant-based meats are at an all-time high. In fact, according to a report from leading market research and consulting firm Coherent Market Insights, the global vegan meat market is set to surpass $6.5 billion by 2026. And that’s just the beginning. The research firm GlobalData reports that there were six times as many vegans in America in 2017 as in 2014, and Allied Market Research predicts that the meat substitute market will grow 8.4 percent from 2015, potentially reaching $5.2 billion globally by 2020. With more and more delicious vegan products hitting the market, there’s truly never been a better time to switch to a compassionate vegan lifestyle. 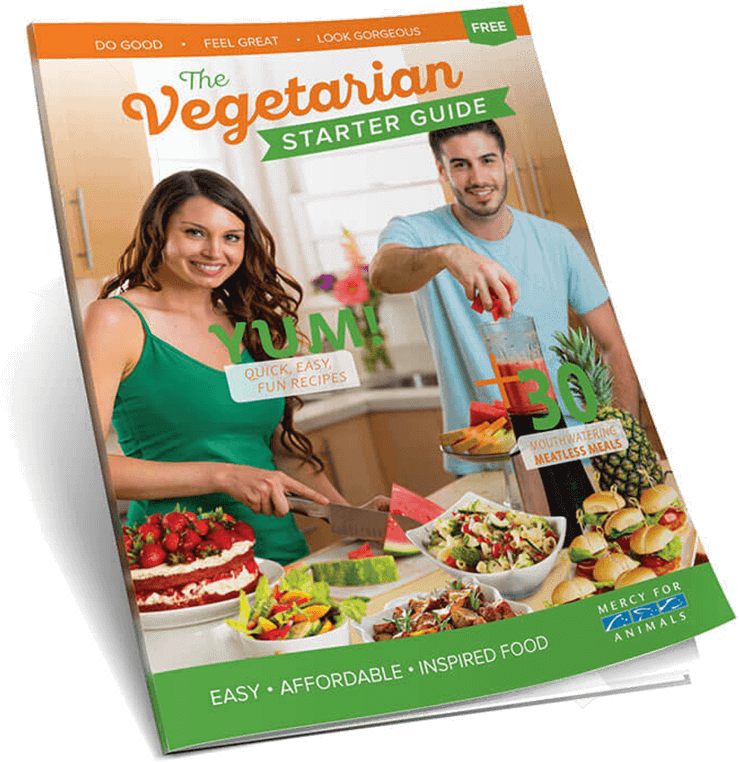 For easy-to-make vegan recipes, simple meal ideas, and tips on making the switch, order a FREE Vegetarian Starter Guide today. Get recipes, meal tips, and more. A project of Mercy For Animals, a 501(c)(3) nonprofit dedicated to promoting compassionate food choices and policies.